First let me say if I could I would skip dinner altogether and just eat dessert! My first bit of advice on this common dilemma is never to fully deprive yourself of anything. It makes me laugh at some of these Pinterest pins that say the way to a healthier you are to have no chocolate, no dessert, no sugar, no liquor, no fried food, etc. SERIOUSLY?! Who could live like that, not me that’s for sure! So I will be totally honest with you, I like to take a little bite of everything. For example, with fried food, I never order French fries but if Kyle gets some, I will have a few (10 or under). If there is a cookie, I’ll take maybe 1/8 of it. Just a little taste because if not, I will think about that cookie and then want the whole darn thing, but if I just have a little bite I am satisfied. Kyle and my family always yells at me because I take a bit of something and then wrap it up and put it back so when someone else goes for it, there is already a bite out of it. The crew guys constantly know when I am in the hauler because there will be an open bag of M&Ms with three taken out or a cookie with a little corner eaten. When I do really want something sweet, though here are a few healthy options, I turn to that are quick and easy. None of this is gourmet or something I would make for a party but these are quick little treats for a normal weekday night when you are craving something sweet! Place grapes in the freezer for a few hours and enjoy! 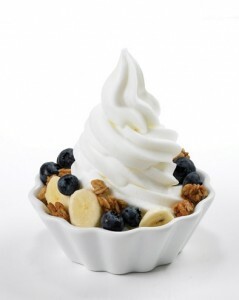 Low-fat frozen yogurt, make sure to load it up with fruit and some almonds for an extra health kick. I like to take Greek yogurt with fruit and mix in a little cool whip for a fluffy texture. I dip apple slices into it for a delicious healthy dessert! Another option is I take one of those 100 calorie chocolate chip cookie packs which have 3.5 grams of fat, and I place a bit of Better N Peanut Butter (see earlier blog in this PB amazing!) and make little sandwiches out of them! Love Smores?? Me too but there is a way healthier version and one that does not require a campfire! I take a low-fat honey Graham cracker and spread a little marshmallow fluff on it (only 20 calories for one tablespoon). Then I drizzle it with a little sugar-free chocolate syrup. It is seriously amazing! If you want them warm pop them in the microwave for a few seconds or in the oven on low heat for a few minutes. Just keep a good eye on them!